Wining, Dining, and Sailing Our Way Through the Islands! For information on ASA’s 2012 flotillas, including Greece June 9-16, click here. Our flotilla began on July 16th, a warm and sunny afternoon. My boat, Maya, known as “the girlie boat,” was ready, as were the other 5 boats. We met in Alimos Marina in Athens at a café at the end of the pier. Alimos is one of the largest marinas in all of Greece and perhaps the Med, with hundreds of boats lined up Med moored on numerous piers. There are several cafés and tavernas on the marina grounds as well as grocery shops and markets within walking distance. Announcements and introductions were made; questions were answered; now it was time to find our floating homes for the week. 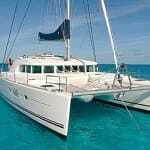 Each group of sailors boarded their yachts which ranged in size from 41’ to 54’. 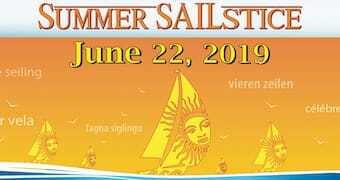 Several of the boats opted to have a Greek skipper come along and take the stress out of sailing in an unfamiliar and challenging sea and really enjoy their holiday. If you’ve never sailed in the Med before it can be a bit daunting, especially when it comes to Med mooring in the small ports. That’s when flotilla sailing and local expertise really comes in handy. As I was told on my first trip to Greece, “This isn’t the Caribbean my dear!” Meaning it’s a bit more of a challenge than I was used to. Everyone got settled in, and that evening we had a brief skipper’s meeting at the Skipper’s Yacht & Roll Bar and determined that we would sail to Epidaurus, which is in the Peloponnese and about a 4 to 5 hour sail from Athens. We would head out at 0900. We awoke to light winds and a sunny day. Everyone was ready to go and we filed out one by one through the narrow exit of the marina. In Greece they are on the Lateral A buoyage system, red is on your starboard when leaving for sea, something to keep in mind for the week! Epidaurus here we come, but first we stop for swimming in the clear turquoise water off the small green island of Angistri. We anchored and took a line ashore to an even smaller rocky island across the narrow channel from Angistri. Apo (short for Apostolles), one of our Greek skippers, arrived first. He was in the water and helped the other boats tie off their sterns to the rocks once they dropped the hook. This is a common practice in Greece and allows more boats to fit in limited space. After a refreshing swim everyone devoured lunch. We had some brave swimmers come by to sample lunch on board “the girlie boat.” Maria, my first mate and Greek chef makes the most wonderful dishes, and this was no exception. Everyone agreed that we were going to be spoiled this week! After lunch in the warm Greek sun it would have been easy to lounge about, but we had to get to Epidaurus and find a parking space! Late afternoon we arrived in Epidaurus to find a small crowded port. Luckily we had called ahead and reserved a few spaces; it helps to know someone on the islands. The boats were moored, now it was time to do a little exploring. There are orange and lemon groves lining the north side of the bay. Several years ago a farmer was digging near his home when he uncovered the ruins of a small amphitheater. Currently there is a dig going on where they are excavating an amazing intact theater overlooking the bay. It’s a great hike up to the area to observe the dig and grab a few oranges off the tree! The next morning we all boarded an air conditioned coach and made our way to one of the most well-known and ancient amphitheaters in existence. The sanctuary of Asclepios (the God of healing) at Epidaurus is a spiritual place worth traveling around the world to visit! In fact the ancient Greeks did just that in order to pay tribute to their spiritual entities in the face of Asclepios, and to ask the gods for remedies for their physical ailments. It was a healing center as well as a cultural center in ancient times. Epidaurus was built around the 3rd century BC and is adorned with a multitude of buildings most famous of which is the ancient Theater of Epidaurus. This is one of the very few theaters that retains its original circular “Orchestra” and it is a rare aesthetic sight. 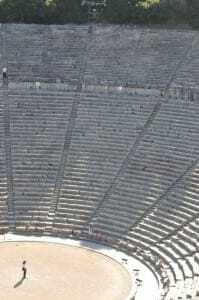 During Roman occupation of Greece, most theater “Orchestras” were changed from a circle to a semicircle but luckily the theater at Epidaurus escaped intact. The view, aesthetics, and acoustics of the theater are breathtaking, as is the feeling I got when I sat on the ancient limestone stone seat–high up–and thought of all the ancients that might have shared this seat with me. After roaming the grounds, the museum and taking turns speaking and/or singing on the ancient stage, we boarded the bus and headed back to port. We were headed around Methana a volcanic peninsula, to the island of Poros in the Saronic Gulf–a good 4 to 5 hour sail. Pame, let’s go! 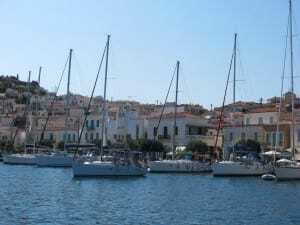 Later that afternoon after sailing and then motoring in light winds Poros was dead ahead. Poros town faces the Peloponnese main land, separated by a narrow channel less than two hundred meters wide in some spots. It’s a tricky navigation. In ancient times it was home to an asylum dedicated to Poseidon, the ruins of which are still accessible on a hilltop close to the town. As you enter through the channel and round the point and head towards Poros town the famous clock tower greets you and under it the whitewashed houses on the hillside which cascade down to meet the water. It’s a view that say, “This is a Greek island!” We found space along the quay for all 6 boats and started with the Med mooring experience. Dinghies were deployed and I or one of the Greek skippers- Christos or Apo, would ride out to assist those who needed our help in docking their boat. We were positioned in front of the Yachting Café which made it convenient for picking up wifi from onboard and having an afternoon frappe and ice cream! 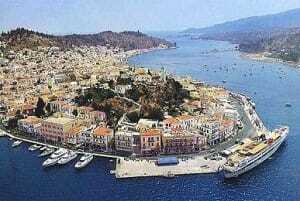 Poros is a great island with everything you need, from lovely beaches, scooter rentals, cafés, tavernas, shops, etc. It’s also where my friends, Michalis and Sakis, are proprietors of a fabulous fresh fish taverna aptly named Oasis. It’s right on the water and we had reservations for a group dinner. We dined on abundant appetizers or meza, Greek salads, a grilled whole fish complete with head and tail for everyone. Fresh carpoozi and peponia (water melon and melon) with semolina (a Greek sweet) completed the feast. Dinner was wonderful and the atmosphere festive. After dinner some of the girls from my boat led the way for dancing at Club Malibu, while others slowly meandered back to the boats. The nice thing about sailing in Greece and Med mooring is that you don’t need the dinghy to go back to the boat, you simply cross the passarella (gang way) and you’re home! Captain Valerie Weingrad owns Custom Sailing Worldwide, holds a USCG 100T Masters license and is an ASA instructor. 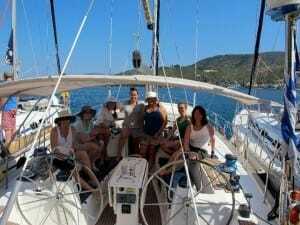 She is a traveler and just completed her 9th summer sailing in the Greek Islands. We still have room for a few boats for this summer’s Greek Island Flotilla in June!